Technology: RIKO products have been developed on the basis of the latest technology. This concerns both chassis and upholstery production. An innovative front suspension system which works in two directions. When a wheel hits an obstacle it bends both vertically and horizontally which prevents form bumping. 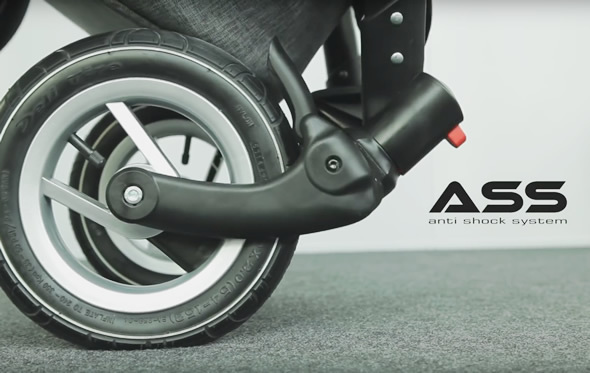 Such a solution ensures a stable ride no matter if front wheels are set to be swivel or locked for a straight ride. A fast front wheel release system. 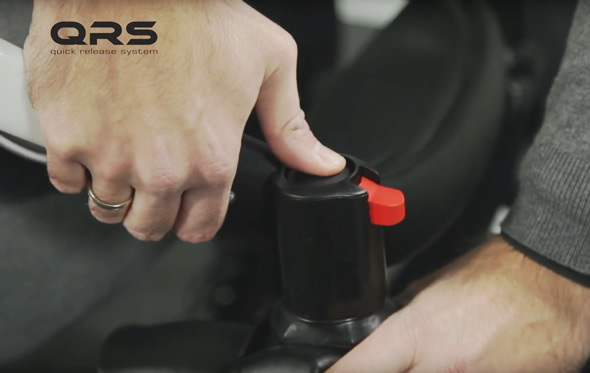 It enables a quick one press disassembly of front suspension system which is very useful when packing the stroller into a car trunk for instance. Assembly of the front suspension system is equally fast and easy. An innovative suspension hardness adjustment system. 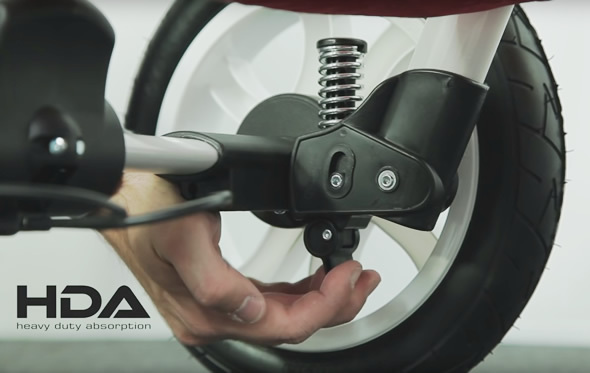 Using a lever you can adjust spring length in rear shock absorbers. If the springs are shorten, the suspension system in harder. Use of this setup is recommended for a seat unit version when your baby is older and more heavy. Longer springs make the suspension system more soft which is recommended for a pram version with carrycot or a version with a 0+ car seat. Safety is our priority. All RIKO products are produced according to European safety standards and have necessary homologations. EN 1888:2012 safety standard is a European standard for prams and pushchairs. It describes all requirements, test methods, dimensions and weights that have to be followed during development and production of a pram or a pushchair. All RIKO products are produced according to this standard. We have our own machinery for resistance tests and we cooperate with accredited laboratories in Poland and abroad. All RIKO car seats have valid safety certificates ECE R44/04 which is a European control standard (ECE) for baby car seats. Each car seat sold in the European Union has to have this certificate. A common name for it is “the orange homologation”. The name comes from an orange sticker with a standard number and weight group on which has to be placed on each product. ECE R44/04 includes a number of tests including frontal crash test with speed of 50 km/h, rear crash test with a speed of 32 km/h and 360 degrees turn of a car. 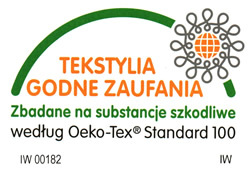 OEKO-TEX STANDARD 100 is the most reliable safety certificate for textiles. Fabrics which carry the OEKO-TEX STANDARD 100 symbol do not contain harmful substances in quantities which could be hazardous for people. All textiles used for RIKO products are manufactured in the European Union and our suppliers have valid OEKO-TEX STANDARD 100 certificates.